Fourth-ranked University of North Carolina Tar Heels captured its fourth Maui Jim Maui Invitational title after defeating 16th ranked Wisconsin 71-56 on Wednesday, Nov. 23, the final day of the tournament. After three days of substantial wins, North Carolina looked like a national title contender. Its first game on Monday was against the Silverswords with a final score of 104-61. Though that was a tough game for the Silversword men’s basketball team, Chaminade was able to hold its own in the two games that followed. On Tuesday, the UConn Huskies barely squeaked by Chaminade 93 to 82. The game was kept close because of Chaminade’s sharp shooting. In Chaminade’s final game, Tennessee skimmed past Chaminade 95 to 81. Chaminade’s Rohndell Goodwin made the Maui Invitational All-Tournament Team. The Invitational has always been more than just the three games played by the teams. Just ask the youths who participated in a free basketball clinic offered by the Swords, or the Chaminade student fans, who came on Monday to experience Maui and the game. Saturday, Nov. 19 to Wednesday, Nov. 23 were five very fast and furious days for the Silversword men’s basketball team and their Chaminade fans. Held on Saturday afternoon at the Lahaina Civic Center Outdoor Courts, the adidas Hoops Clinic presented by HMSA offered a free basketball clinic to youths. More than 60 third through eighth graders showed up hungry to play and to learn the game. The children performed the drills tirelessly, passing and shooting their basketballs as the college players shared their approval with smiles, encouraging words and high fives. The kids were especially ecstatic to receive two free tickets (one adult, one youth) to Chaminade’s Monday night game against University of North Carolina. Chaminade University, The Maui Jim Maui Invitational Tournament, adidas and HMSA have hosted similar basketball clinics this year throughout the state. The overall goals of the clinics have been to promote the fundamentals of the game and to offer opportunities to learn from qualified, collegiate coaches and administrators. That Saturday evening, the teams and their entourages attended the Coaches Luau at the Sheraton Maui Resort and Spa. It was a traditional Hawaiian Luau, complete with ono food and entertainment. There were also a hula competition and a bean bag tournament. Tar Heel Joel Berry II won the overall hula dance-off and eventually earned the Maui Invitational tournament MVP award. The Tar Heels also won the bean bag tournament. Wounded Warrior, veteran Tommy Counihan IV was honored at the luau. Chaminade regent, Carolyn Berry Wilson, and her husband David Wilson have annually sponsored this Wounded Warrior project, which covers all the Maui Jim Maui Invitational costs for the selected veteran. The Maui Jim Maui Invitational held its annual Sunday morning Coaches Press Conference at the Sheraton Maui Resort Spa. It was an opportunity for all of the eight head coaches to speak about their teams before heading into the start of Monday’s championship round. The press conference was moderated by NBA Hall of Famer and broadcast commentator, Bill Walton. After the press conference, the eight head coaches took up a friendly free throw competition. Each coach teamed up with a local middle schooler. Every person had three free throw attempts on a portable basketball, which was set up along Kaanapali Beach. Chaminade’s head coach, Eric Bovaird, and his student tied with Oklahoma State’s Brad Underwood through the initial round, with Bovaird hitting all three free throws. Bovaird and his young protégé Reizel of Lokelani Intermediate School went on to win the free throw contest in overtime. Thirty-eight Chaminade students with some staff and faculty braved an early morning trek to Maui. Though the game was not until evening, the Silversword students took the opportunity to explore Maui, thanks to a day trip arranged by the Office of Student Activities and Leadership (OSAL). After landing, the students headed to Krispy Kreme where they indulged in the breakfast of champions: donuts (yes, plural) and coffee. With a sugar-caffeine high, the students tackled a Maui Nei 2-hour walking adventure tour in Lahaina. Guided by a Native Hawaiian kumu, they explored Lahaina’s rich history and learned about old Hawaii during the missionary and whaling times, and about the monarchy and plantation eras. After the tour, the students ate lunch at a nearby beach park. 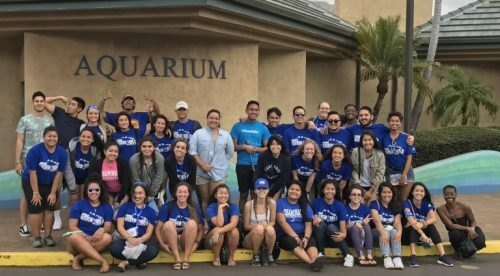 Later, they visited the Maui Ocean Center, the nation’s largest tropical reef aquarium. The students explored a mix of more than 60 indoor and outdoor exhibits. After all the educational activities, they arrived at the Lahaina Civic Center pumped up for the game. The students got a chance to hang out at Fan Fest, where they enjoyed a “basketball” meal and bought souvenirs and gifts. They even made their ESPN debut, showing their Silversword spirit for the cameras. Finally, it was game time. Wearing their Chaminade t-shirts that they received earlier that morning, they formed a sea of blue in the stands behind the Chaminade bench. They were loud and proud. Though the Swords lost to the University of North Carolina, the students cheered for their home team until the last buzzer. 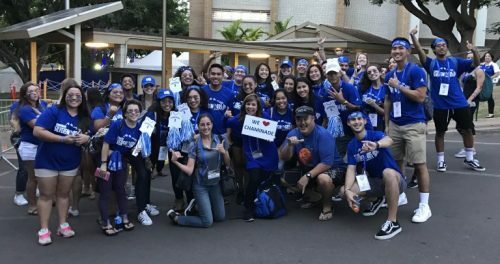 Exhausted and hoarse from cheering but glad that they had made it to Maui, the students returned to Honolulu later that night. After all, there were still classes to attend on Tuesday.